​THANK YOU CEO LUNCHEON SPONSOR: FIFTH THIRD BANK! Fifth Third Banks Empower U Financial Wellness Program is custom built to meet the unique needs of our customers and customers' employees, faculty, and/or staff. Each presentation is designed to help employees in their journey to becoming more financially fit. The annual HFC Safety Council CEO Luncheon will be held Thursday, June 15th! We have the pleasure of welcoming Brad Hurtig, as our keynote speaker this year. Don't miss this excellent opportunity to fulfill your CEO attendance requirement and connect with an amazing and inspirational speaker! "Brad Hurtig was a student-athlete in a small town in Northwest Ohio. Only days after finishing his sophomore year of high school, a devastating workplace accident resulted in the amputation of both of Brad's hands. Through hard work and determination Brad soon rejoined his high school football team. In his senior year, Brad led his team defense, recording 111 tackles and receiving all-state honors all while playing with no hands. Brad's inspirational story of triumph quickly captured national headlines. 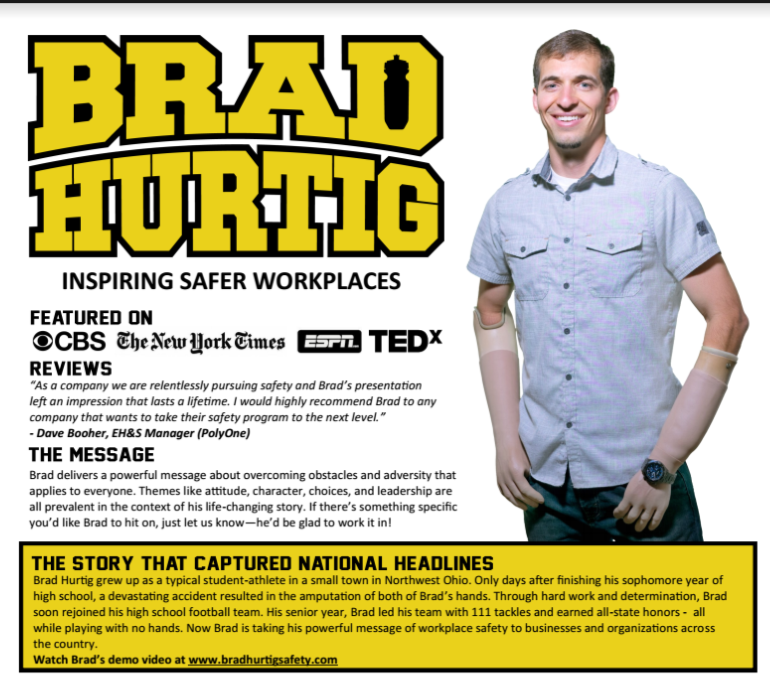 Now Brad is taking his powerful message of workplace safety to businesses and organizations across the country." Please note that the lunch payment for the CEO luncheon is $20.00/person. Who to Invite: This is an excellent opportunity to fulfill your company's CEO attendance requirement, but you don't have to be a CEO to attend. We encourage to you invite any employees who would benefit from this meeting. Our final monthly meeting of the Safety Council year is Wednesday, June 7th, 2017, at the Ponderosa Banquet Center in Hillsboro, Highland County. Contact us at (740) 335-0761 if you have any questions!! Information on the diseases, how they are transmitted, and potential exposure at work. My name is Kelsey Cloud and I live in Leesburg, Ohio. My husband Joe and I live on a cattle farm and have a 17-month-old little girl named Ellie. I graduated with my BSN from Wright State University in 2012. I returned for my MSN with a focus in Nursing Administration from Indiana Wesleyan University in August of 2016. I have worked in various positions over the last 5 years which include: medical-surgical, critical care, and quality management and infection prevention. I currently am employed at Highland District Hospital working in Infection Control. I currently love my position and am excited for the opportunities that lie ahead of me. In addition to your primary Safety Council representative, we encourage you to invite any employees who would benefit from this month's topic! Our next meeting of the Safety Council year is Wednesday, May 3rd, 2017, at the Wilmington City Building in downtown Wilmington. Contact us at (740) 335-0761 if you have any questions!! Colonel Brian L. Prickett began his career with the Clinton County Sheriff’s Office in 1984 as a certified peace officer assigned to the corrections division. Colonel Prickett is a 1983 graduate of Wilmington High School and attended the Greene County Peace Officers Training Academy in 1984 where he completed the basic law enforcement academy. In 2000, Colonel Prickett completed Corrections Basic Training for Full Service Jails at the Pickaway County Sheriff’s Academy, and completed Correctional Administrator Training for Full Service Jails at the Ohio Peace Officers Training Academy in London, Ohio. In 2008, Colonel Prickett was nominated to, and graduated from the F.B.I. National Academy, 235th Session in Quantico, Virginia. The FBI National Academy is a professional course of study for U.S. and international law enforcement leaders that serves to improve the administration of justice in police departments and agencies at home and abroad and to raise law enforcement standards, knowledge, and cooperation worldwide. Colonel Prickett holds an Associate’s Degree of Applied Science in Law Enforcement Technology from Southern State Community College, and a Bachelor’s of Science Degree in Public Safety Management from Franklin University. The HFC Safety Council will be holding our 2017 Safety Awards Ceremony at the Wednesday, April 5th meeting. We encourage you all to send a representative to our awards ceremony to collect your certificate! Our April meeting will feature Forklift Training and Safe Work Practices, including OSHA forklift training guidelines and best practices for safe powered equipment operation. Our next meeting of the Safety Council year is Wednesday, March 1st, 2017, at the Ponderosa Banquet Center in Hillsboro, Highland County. Contact us at (740) 335-0761 if you have any questions!! Our next meeting of the Safety Council year is Wednesday, February 1st, 2017, at the Community Room of the Wilmington City Building, Wilmington, Clinton County. Contact us at (740) 335-0761 if you have any questions!! Our February presentation will be an interactive discussion on safe driving and the practices to use and avoid to keep yourself and your employees safe on the road. Brandon graduated from The Ohio State University in 2000 with a Bachelor’s Degree in Atmospheric Sciences. He began his career working as a forecaster in the private sector from 2000 to 2002, then joined the National Weather Service at the Elko, Nevada Forecast Office. After forecasting a year and a half in the Great Basin, Brandon returned east and spent 11 years forecasting at the Baltimore/Washington National Weather Service Forecast Office located in Sterling, Virginia. While there, he experienced a wide array of severe weather events, including a tornado outbreak from the remnants of Tropical Storm Ivan in September 2004, significant flash flooding in June 2006 and the derecho of June 2012. He also worked numerous winter storms, particularly during the record-breaking winter season of 2009-2010. Brandon returned to Ohio in February 2015 as Warning Coordination Meteorologist at the Wilmington, Ohio National Weather Service Forecast Office. In this role, he is responsible for ensuring that customers and citizens are prepared for hazardous weather. The Wilmington Office is one of the most active offices in the country in terms of severe weather and flooding, and provides warnings and forecasts for 52 counties in central and southwest Ohio, southeast Indiana and northern Kentucky. This information will be invaluable with shaping the remaining Safety Council meetings and planning for next year. John Hanna has served as director of the pharmacy program for the Ohio Bureau of Workers’ compensation since 2009. In this role, he directs pharmacy services for the agency and provides oversight for all pharmacy issues related to workers’ compensation claims. He also manages the evaluation of claims for drug appropriateness (e.g., use of narcotics, duration of medication given allowances in claim, etc. ); consults with private medical providers to develop appropriate medication utilization plans; and serves as the lead for ensuring quality of pharmacy services as well as appropriateness of care and reimbursement. He took the lead in implementing Ohio’s first-ever formulary for workers’ compensation in 2011. Hanna was previously the Director of Pharmacy with the Adena Regional Health System in Chillicothe, for eight years. Prior to working with Adena, he held diversified managerial and administrative positions with multi-hospital health systems in the greater Cincinnati area. He began his management career with Clinton Memorial Hospital in Wilmington, serving as Director of Pharmacy before moving into hospital administration. John is a Fellow of the Leonard Davis Institute at the University of Pennsylvania, Wharton School and served as an adjunct clinical instructor at the University of Cincinnati, College of Pharmacy for over 15 years. He is a past member of the Ohio Board of Pharmacy and also served on the Advanced Practice Nurse Formulary Committee of the Ohio Nursing Board. As a member of the Ohio Pharmacist Association, he serves on the Legislative Affairs Committee. John is currently a member of Ohio Governor John Kasich’s Cabinet Opiate Action Team. John received a Master of Business Administration, from Xavier University and a Bachelor of Science in Pharmacy from the University of Cincinnati. Our September 7th HFC meeting will cover the new OSHA Recordkeeping Reporting Rule. The new rule, which takes effect August 10, 2016, requires certain employers to electronically submit injury and illness data that they are already required to record on their onsite OSHA Injury and Illness forms. Audrey Rogers, Industrial Hygienist with OSHA, will present on the details and compliance of this new rule as it relates to our Safety Council members. Audrey Rogers has been employed with Federal OSHA for 15 years as a Compliance Officer. During that time, Audrey has conducted both Health and Safety inspections, primarily in the general industry setting. She has also conducted complaint, programmed, accident and fatality inspections. Some of Audrey's areas of specialty include recordkeeping, blood borne pathogens and ergonomics. 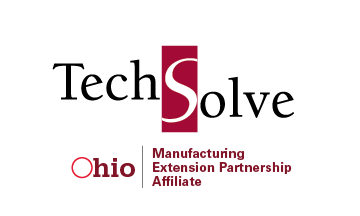 TechSolve is a nationally recognized provider and Ohio’s leader in process improvement expertise across four major industry sectors: manufacturing, advanced machining, aerospace & defense, and healthcare.